Mentoring in IBD is an innovative and successful educational program for Canadian gastroenterologists that now includes an annual national meeting, regional satellites in both official languages, a website, an educational newsletter series, and regular electronic communications answering key clinical questions with new research. This issue is based on the presentation made by contributing editor, Dr. Brian G. Feagan, at the annual national meeting, Mentoring in IBD XV: The Master Class, held November 7, 2014 in Toronto, Ontario. The use of tumour necrosis factor-α (TNF-α) inhibitors was first reported in a letter to the editor of a gastroenterology journal in 1992. In the more than 20 years since that initial report, TNF-α inhibitors have evolved into standard therapy for patients with severe inflammatory bowel disease (IBD). Although these agents have substantially improved patient care, recent data indicate that optimization of biologic use may result in even greater efficacy and safety gains. Obstacles to effective optimization include a variety of misconceptions about the clinical pharmacology of TNF-α inhibitors, the persistence of a step-care approach, concerns about the safety of biologics, and the concept of stopping therapy in patients in remission. Numerous misconceptions about the pharmacology of monoclonal antibodies, and therefore their clinical use, still exist. It was known more than 60 years ago that all foreign proteins are immunogenic, and that T cells recognize the 3-dimensional shape of foreign antigens. In fact, Sir Frank Macfarlane Burnet and Sir Peter Medawar won the 1960 Nobel Prize in Physiology or Medicine for the discovery of acquired immunological tolerance, which laid the foundation for transplantation medicine. Multiple determinants of immunogenicity exist, including genetics, route of administration, disease state, molecular weight, concomitant treatment, exposure schedule, and antigen dose. The cell line used to develop the foreign proteins is not a principal determinant of immunogenicity. Studies have also shown that immunosuppressive drugs decrease clearance of TNF-α inhibitors. In a cohort of 125 consecutive patients with Crohn’s disease (CD) treated with episodic infliximab, Baert et al evaluated drug concentration; clinical data; side effects, including infusion reactions; concomitant medication use; and the clinical significance of antidrug antibodies (ADAs) against infliximab. (1) The presence of ADAs was linked to an increased risk of infusion reactions and a reduced duration of treatment response. Concomitant immunosuppressive therapy decreased the risk of infusion reactions and treatment duration reduction (P<.001). Sensitization was shown to be an important clinical issue in the landmark randomized, double-blind Study of Biologic and Immunomodulator Naive Patients in Crohn’s Disease (SONIC), which evaluated the comparative efficacy and safety of infliximab monotherapy, azathioprine monotherapy, and the two drugs combined in 508 patients with moderate-to-severe CD. 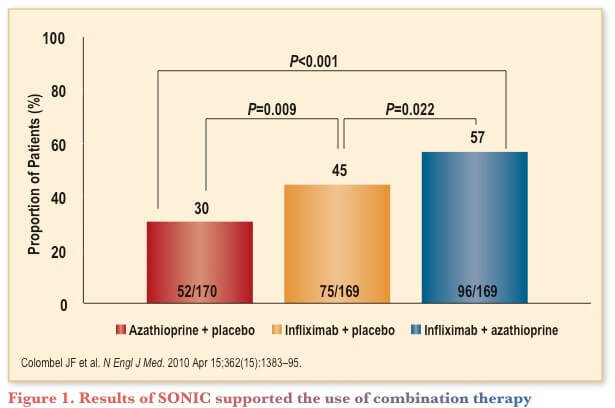 (2) The study found the rates of corticosteroid-free remission and mucosal healing to be significantly greater among patients receiving combination therapy than among those treated with infliximab or azathioprine alone (Figure 1). SONIC demonstrated that combination therapy reduced immunogenicity and infliximab clearance, increasing trough levels and the remission rates. The importance of maintaining adequate trough levels has since been replicated for other TNF-α inhibitors. The reduction in sensitization with combination therapy was replicated in a trial of adalimumab, a fully human antibody, in patients with rheumatoid arthritis. (3) Over a 3-year period, ADA development was linked with decreased levels of adalimumab and rates of minimal disease activity or clinical remission and increased treatment discontinuation due to treatment failure. A clinically important finding was that most sensitization occurs during the first 12 to 16 weeks of therapy, and sensitization also correlated with trough levels and pharmacodynamic effects. Further clinical trial data confirmed these findings. A comparison of the pharmacokinetics of infliximab in pediatric and adult patients with moderately to severely active CD used data from A Randomized, Multicenter, Open-Label Study to Evaluate the Safety and Efficacy of Anti-TNF-α Chimeric Monoclonal Antibody in Pediatric Subjects with Moderate-to-Severe Crohn’s Disease (REACH) and A Crohn’s Disease Clinical Trial Evaluating Infliximab in a New, Long-term Treatment Regimen (ACCENT I). (6) The analysis found comparable pharmacokinetic characteristics across both studies, with increased drug clearance linked to antibody formation and to decreasing serum albumin concentration, and decreased clearance associated with immunomodulator administration. The value of therapeutic drug monitoring (TDM) was first demonstrated by a retrospective review of the effect of testing on clinical management at the Mayo Clinic. (9) The study found that clinicians measured drug levels for several reasons: loss of response to infliximab, partial response after treatment initiation, and possible adverse reactions. Testing identified ADAs in 23% of patients and therapeutic infliximab concentrations in 33% of patients, and test results affected treatment decisions in 73% of cases. 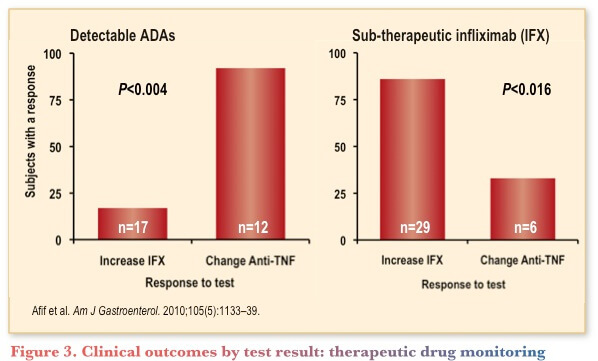 In patients with ADAs, changing the TNF-α inhibitor produced a complete or partial response in 92%, whereas escalating the dose in patients with subtherapeutic drug levels produced complete or partial clinical response in 86% (Figure 3). These and other similar findings have led to the development of the current TDM approach to treatment management (Table 1). It is currently unknown whether ADAs are the cause or consequence of low serum infliximab levels, and this uncertainty leads to the hypothesis that maintaining drug concentrations within the therapeutic window may allow elimination of immunosuppressive therapy. The foundation of the step-care approach was the National Cooperative Crohn’s Disease Study (NCCDS), published in 1979. (10) This placebo-controlled, randomized, multicentre trial evaluated prednisone, sulfasalazine, and azathioprine in 569 patients with CD. The planning of this trial included the development of a composite measure of clinical disease, the Crohn’s Disease Activity Index (CDAI). A subsequent trial found little correlation between the CDAI and the Crohn’s Disease Endoscopic Index of Severity (CDEIS). (11) These findings decreased the emphasis on endoscopic healing in favour of a focus on clinical improvement. Data supporting more aggressive initial therapy then began to accumulate. Furthermore, an open randomized comparison of early combined immunosuppression with infliximab, azathioprine, and corticosteroids as necessary with conventional management in patients with newly diagnosed CD confirmed the role of combination therapy. 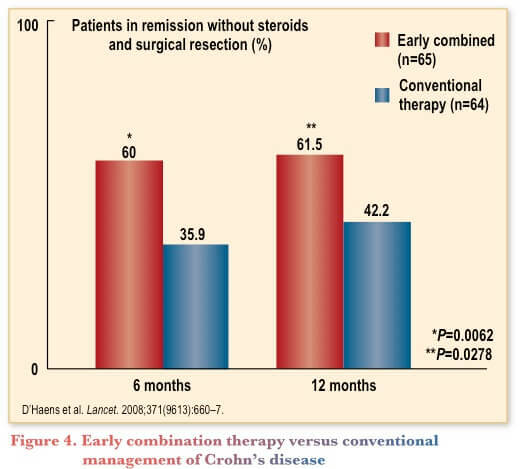 (14) The study found combined immunosuppression more effective in remission induction and suggested a benefit for intensive therapy early in the disease course (Figure 4). The results of the SONIC trial confirmed the benefit of aggressive therapy. (2) SONIC also correlated these results with improvement in objective measures of inflammation and lack of improvement in patients without evidence of inflammation. Clinical experience with combination therapy has clearly shown that optimizing therapy with biologics does not carry a risk of serious toxicity. In fact, multivariate Cox proportional hazard regression analysis of data from the Crohn’s Therapy, Resource, Evaluation and Assessment Tool (TREAT) registry demonstrate that it is corticosteroid therapy and narcotic analgesics, a surrogate for severe disease activity, that are associated with increased mortality and serious infection. (16) Infection is generally associated with debilitated patients with active disease who are receiving corticosteroid therapy, and fears of combination therapy are unverified. Stopping therapy cannot be considered optimizing treatment for patients in remission. The argument for stopping therapy is that continued treatment may not be necessary for long-term good outcomes, and no treatment is both less toxic and less costly and more convenient than long-term treatment. However, discontinuing treatment may result in worse outcomes and it may not necessarily be safer. In addition, the risk of sensitization exists, and the opportunity to change the natural history of the disease may be lost when therapy is stopped. A multicentre, double-blind, noninferiority withdrawal study among patients with stable disease who had taken azathioprine for at least 3.5 years found an increased risk of relapse over 18 months among patients who discontinued therapy. (19) A 2-year randomized trial of immunosuppression withdrawal in patients receiving scheduled infliximab maintenance found no clear clinical benefit of immunosuppression continuation after 6 months of combination therapy. (20) However, the study was underpowered, calling into question the validity of the findings. In addition, monotherapy was associated with lower infliximab drug levels, and in some cases, undetectable drug levels; and significantly higher CRP levels, pointing to the potential for loss of efficacy over time and the risks associated with stopping therapy. The potential of treatment optimization to change the disease course for many patients may be realized with the evolution of personalized therapy using TDM. Step care no longer has a place in therapy. Instead, high-risk patients need to be identified and treated early with combination therapy. The safety of long-term combination therapy does not appear to be a concern and should not be a reason for treatment discontinuation in patients in remission. For both UC and CD, a treat-to-target paradigm based on both clinical symptoms and objective evaluation of response is evolving, with endoscopic assessment playing a vital role. Baert F, Noman M, Vermeire S, et al. Influence of immunogenicity on the long-term efficacy of infliximab in Crohn’s disease. N Engl J Med. 2003;348(7):601–8. Colombel JF, Sandborn WJ, Reinisch W, et al for the SONIC Study Group. Infliximab, azathioprine, or combination therapy for Crohn’s disease. N Engl J Med. 2010;362(15):1383–95. Bartelds GM, Krieckaert CLM, Nurmohamedet MT, et al. Development of antidrug antibodies against adalimumab and association with disease activity and treatment failure during long-term follow-up. JAMA. 2011;305(14):1460–8. Ordás I, Mould DR, Feagan BG, Sandborn WJ. Anti-TNF monoclonal antibodies in inflammatory bowel disease: pharmacokinetics-based dosing paradigms. Clin Pharmacol Ther.2012;91(4):635–46. Fasanmade A, Adedokun OJ, Olson A, et al. Serum albumin concentration: a predictive factor of infliximab pharmacokinetics and clinical response in patients with ulcerative colitis. Int J Clin Pharmacol Ther. 2010;48(5): 297–308. Fasanmade AA, Adedokun OJ, Blank M, et al. Pharmacokinetic properties of infliximab in children and adults with Crohn’s disease: a retrospective analysis of data from 2 phase III clinical trials. Clin Ther. 2011 Jul;33(7):946–64. Adedokun OJ, Sandborn WJ, Feagan BG, et al. 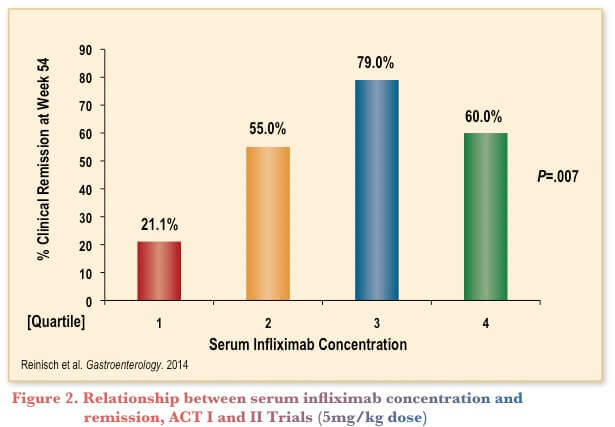 Association between serum concentration of infliximab and efficacy in adult patients with ulcerative colitis. Gastroenterology. 2014;147(6):1296–1307. Khanna R, Levesque BG, Sandborn WJ, Feagan BJ. Therapeutic drug monitoring of TNF-antagonists in inflammatory bowel disease. Gastroenterol Hepatol. 2014;10(8):478–89. Afif W, Loftus EV, Faubion WA, et al. Clinical utility of measuring infliximab and human anti-chimeric antibody concentrations in patients with inflammatory bowel disease. Am J Gastroenterol. 2010;105(5):1133–9. Summers RW, Switz DM, Sessions JT Jr, et al. National Cooperative Crohn’s Disease Study: results of drug treatment. Gastroenterology. 1979;77(4 Pt 2):847–69. Cellier C, Sahmoud T, Froguel E, et al. Correlations between clinical activity, endoscopic severity, and biological parameters in colonic or ileocolonic Crohn’s disease. A prospective multicentre study of 121 cases. Gut. 1994;35:231–5. Lemann M, Mary J-Y, Duclos B, et al, for Groupe d’Etude Therapeutique des Affections Inflammatoires du Tube Digestif (GETAID). Infliximab plus azathioprine for steroid-dependent Crohn’s disease patients: a randomized placebo-controlled trial. Gastroenterology. 2006;130:1054–61. Breedveld FC, Weisman MH, Kavanaugh AF, et al, for the PREMIER Investigators. The PREMIER study. A multicenter, randomized, double-blind clinical trial of combination therapy with adalimumab plus methotrexate versus methotrexate alone or adalimumab alone in patients with early, aggressive rheumatoid arthritis who had not had previous methotrexate treatment. Arthritis Rheum. 2006;54(1):26–37. D’Haens G, Baert F, van Assche G, et al; Belgian Inflammatory Bowel Disease Research Group; North-Holland Gut Club. Early combined immunosuppression or conventional management in patients with newly diagnosed Crohn’s disease: an open randomised trial. Lancet. 2008;371(9613):660–7. Feagan BG, Panaccione R, Sandborn WJ, et al. Effects of adalimumab therapy on incidence of hospitalization and surgery in Crohn’s disease: results from the CHARM study. Gastroenterology. 2008;135(5):1493–9. Lichtenstein GR, Feagan BG, Cohen RD, et al. Serious infection and mortality in patients with Crohn’s disease: more than 5 years of follow-up in the TREAT™ Registry. Am J Gastroenterol. 2012;107(9):1409–22. Fagerlin A, Ubel PA, Smith DM, Zikmund-Fisher BJ. Making numbers matter: present and future research in risk communication. Am J Health Behav. 2007;31(Suppl 1):S47–56. Peters E, Hibbard J, Slovic P, Dieckmann N. Numeracy skill and the communication, comprehension, and use of risk-benefit information. Health Aff (Millwood). 2007;26(3):741–8. Lémann M, Mary JY, Colombel JF, et al for the Groupe D’Etude Thérapeutique des Affections Inflammatoires du Tube Digestif. A randomized, double-blind, controlled withdrawal trial in Crohn’s disease patients in long-term remission on azathioprine. Gastroenterology. 2005;128(7):1812–8.